NEW PRODUCT – Universal Qi Wireless Receiver Module « Adafruit Industries – Makers, hackers, artists, designers and engineers! If you have a modern smart phone you may have noticed that it comes with built in wireless charging capability called ‘Qi charging.’ Qi is a trademark name for a thin and smart inductive charging system. Many large gadget companies have standardized on Qi, which means it’s easy to find a charging dish and we thought it might be cool if your Arduino project can recharge itself wirelessly. Thus, we now have a Qi charging receiver module as seen here here. This is just the inductive charging Qi receiver, it will work with any Qi charger base transmitter. that will work well with any standard inductive charger base. Simply solder two wires to the V+ and Gnd pins on the Qi module and place the item you want charged onto a charging base. The receiver chip manages the coil so that you’ll always get 5V and 500mA. If the coil is too far it will simply not activate at all. In our demo below, we used a classic cell phone charger plate. To demo it, we wired the module to a MiniLipo charger and a LiPo battery, as shown in the photos. 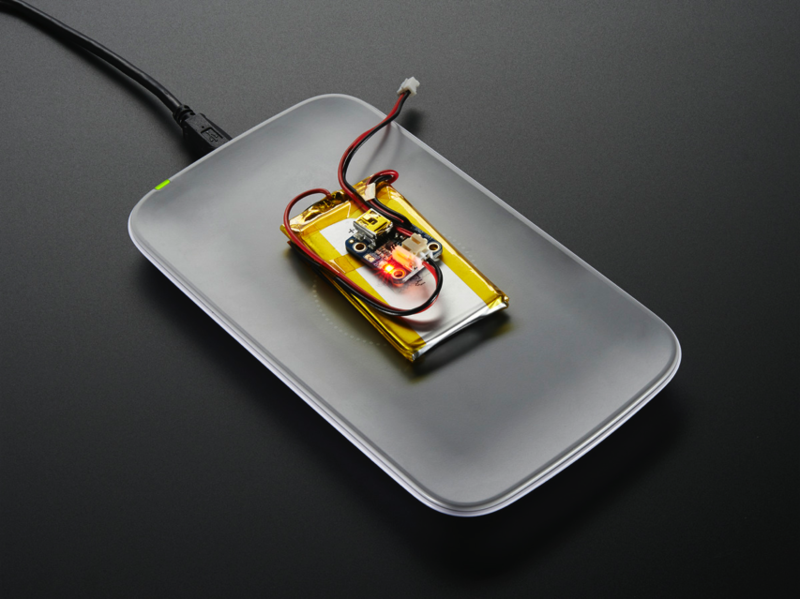 Now we have a wirelessly-rechargeable battery! Note that you don’t get the battery or lipo charger in your order, that’s just how we’re showing it off. You can even upgrade any device that takes classic USB 5V and up to 500mA. 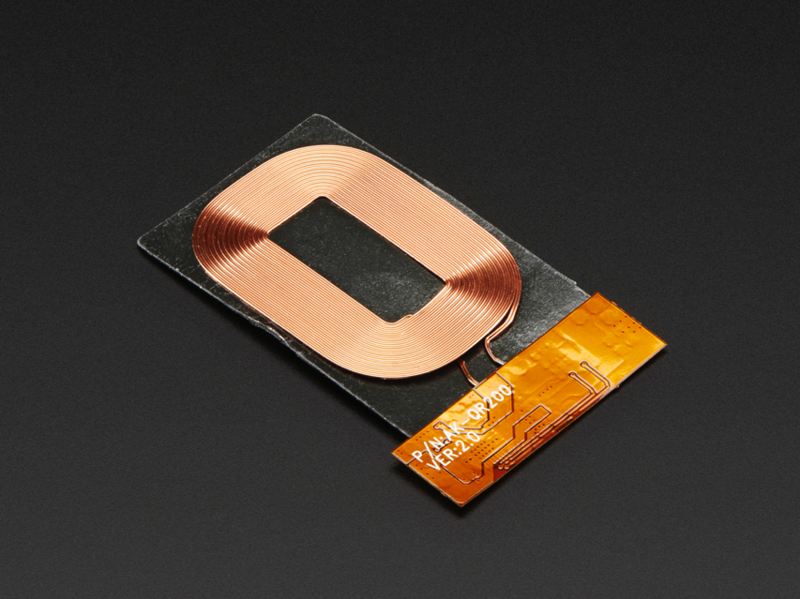 The coil comes on a metallic sticker which is used to shield the device from the coil. Make sure the coil is facing out towards the charger when you install it into your project, or it wont work at all! The driver chip is an integrated receiver called the BQ51053B from TI. Since its a Qi charger it can only be used with Qi transmitters! If you want a simpler inductive charger, check out our 5V charger set – it isn’t Qi compatible but used together it works quite well!